Mohammad Eunos Abdullah (1876-1933) was a campaigner for the Malay cause in Singapore. He was also known as the father of modern Malay journalism. Eunos fought hard for Malay rights especially in education. He died at the age of 57; he was a journalist, a politician and founder of the Singapura Malay Union (Kesatuan Melayu Singapura,KMS). 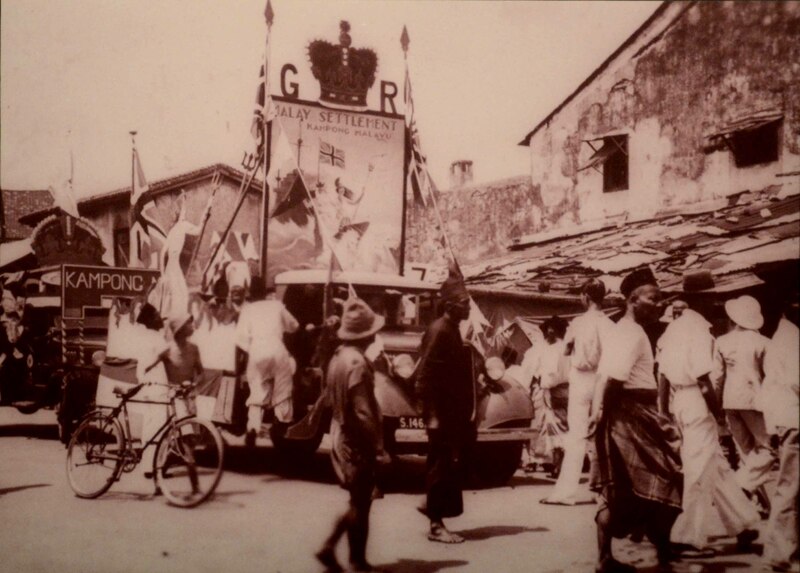 His passion in championing Malay rights in Singapore went on to inspire future Malay nationalists in Malaya. Eunos was born in Singapore to a successful Minangkabau trader from Sumatera, Indonesia. He had his early education in a Malay school in Kampong Glam and he was among the very few Malays who studied at Raffles Institution. Upon graduation, he joined the government service. 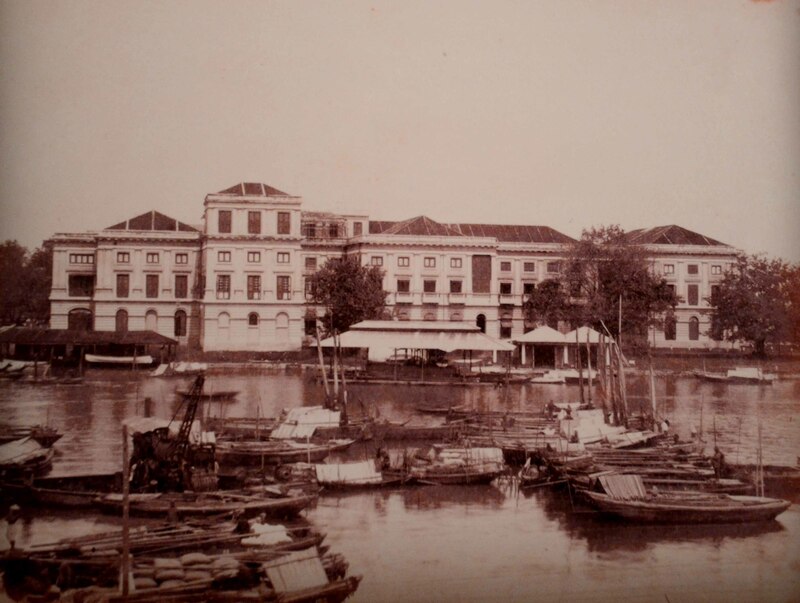 His early career in Singapore was that of an attendant at the Harbour Master’s office; he was later promoted as Harbour Master in Muar, Johore. In the early 19th century, Munshi Abdullah, the father of modern Malay literature, was also a renowned Islamic scholar with his modernistic interpretation of Islam in the region. Eunos was inspired by his writings. At the age of 31, Eunos was offered a job as an Editor for the Utusan Malayu, a Malay language version of the English newspaper in Singapore. Thus, was the beginning of his opinionated voice on racial nationalism of “bumiputra” son of the soil issues. He also spoke up against the Muslim Arab descendants who were monopolizing the social and economic environment in Singapore. 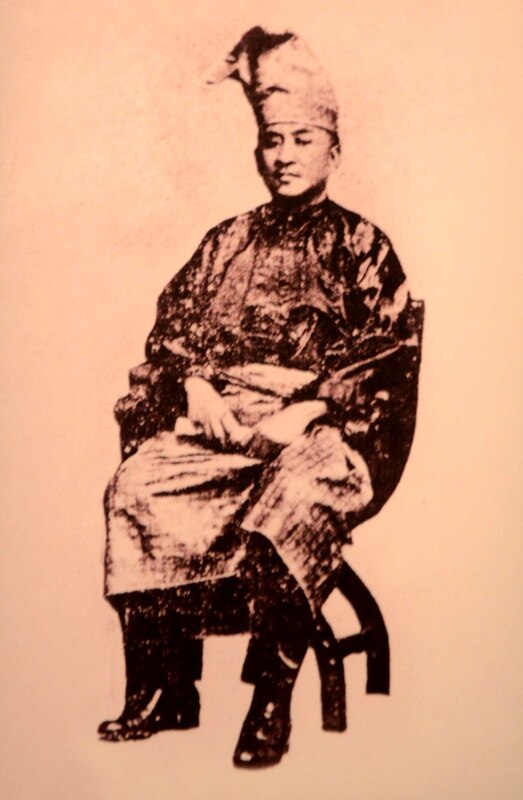 From literary work, he instantly became a political activist representing the Malay voice during the colonial era. “Being unable to swim, he sinks and is lost in the swelling sea of unemployment. Surely, Sir, this is not a thing to be desired among the original son of the soil? I am confident, Sir, ways and means can be found which will enhance the prospects of boys of the soil and remove forever the penalization which oust them from their own markets simply because they happen to be the imperfect products of an imperfect system of education”. The minutes of this Legislative Council’s proceedings recorded that there was an immediate applause from his friends and Asian councillors in the audience. In 1926, Eunos and his associates formed the Kesatuan Melayu Singapura (KMS) or the Singapore Malay Union; he was made its President. 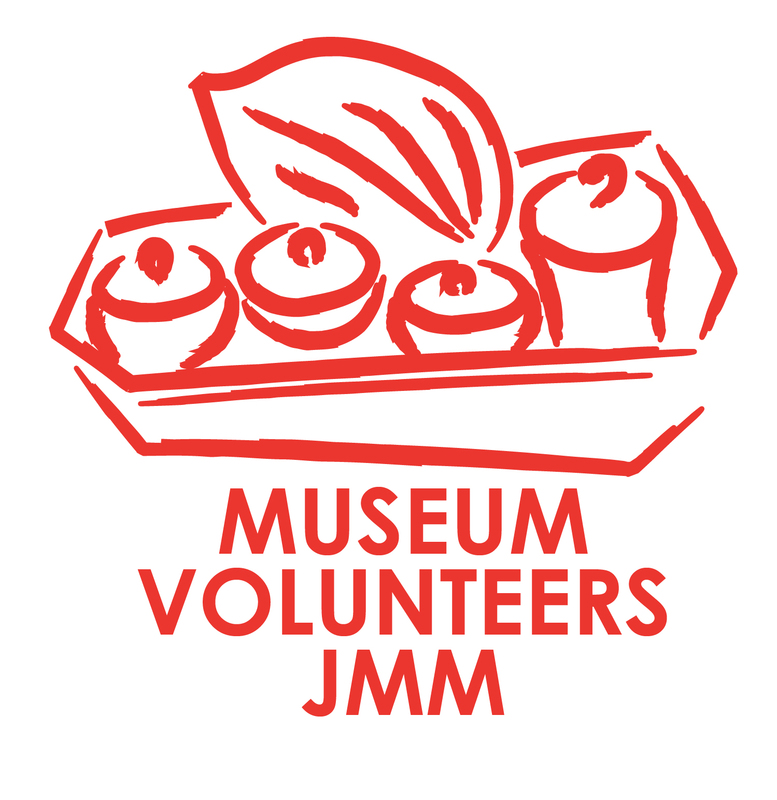 KMS was the first political organisation set up to champion Malay rights such as increasing Malay representation in the government service, upholding Malay interests, and promoting higher education for the Malays. A letter from Eunos Abdullah to The Straits Times. 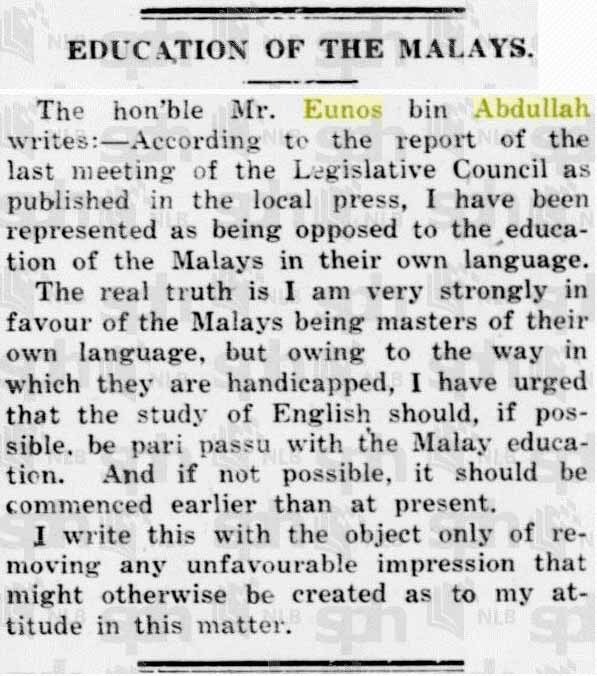 During the legislative meetings, Eunos Abdullah also pushed for Malay children to be taught English from a younger age so they would not be handicapped when transiting from vernacular to English schools. From The Singapore Free Press and Mercantile Advertiser, 7 November 1924, Page 6. He wanted a strong sense of Malay nationalism and called for the preservation of its culture or roots to be known and recognised. Eunos pushed to increase the education budget so that Malays could enter into the medical college and attend Malay vernacular or trade schools. He also advocated for better living conditions and sanitation for the Malay community. He proposed to build a settlement of Kampung Melayu to uphold the Malay values. Eunos was eventually given a grant to purchase and build the settlement. It was named Kampung Melayu or Kampung Eunos. In 1981, the settlement paved way for the construction of Pan Island Expressway and development of housing estates. To commemorate Eunos’s legacy, one of the local residential districts near Kampung Eunos was named EUNOS. Eunos retired in early 1933 and passed away in December 1933. He was laid to rest in the Bidadari Cemetery, Singapore.